Breakfast. There is something wonderful about having a delicious first meal to start one’s day. Especially if you only have to prepare it once and just plop it in the good ol’ microwave the rest of the week. 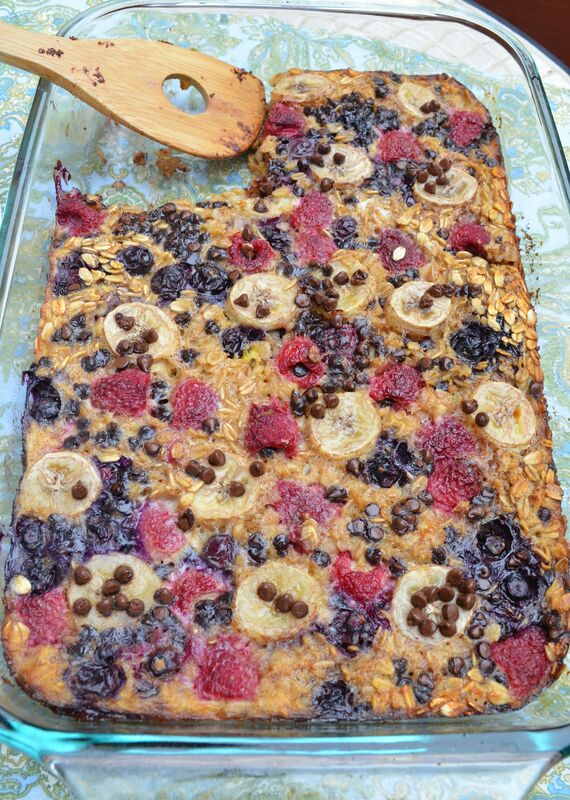 This baked oatmeal is in essence, a casserole! 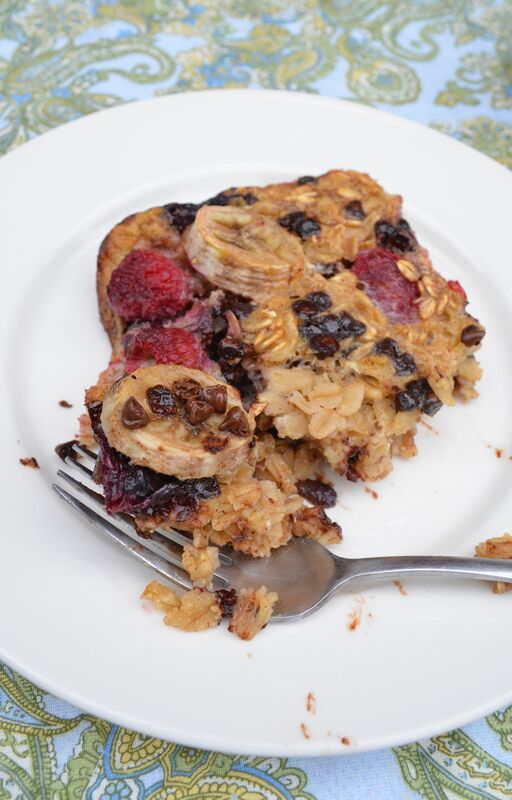 A wonderful sweet casserole with gluten-free rolled oats, berries, banana, and a little chocolate. Sign me up! Chris and I made this dish last for four days, four glorious days where we both knew what we were going to eat for breakfast. 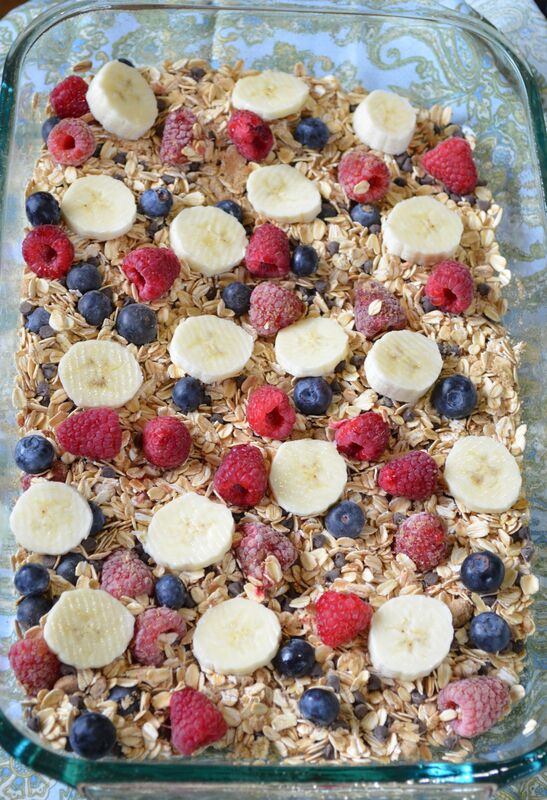 I love this because you can use any berry you have on hand, so feel free to use your favorites. It is also a great way to use a ripe banana. This recipe makes a great week-day breakfast, and is spiffy enough for weekends or when company is over. Enjoy! 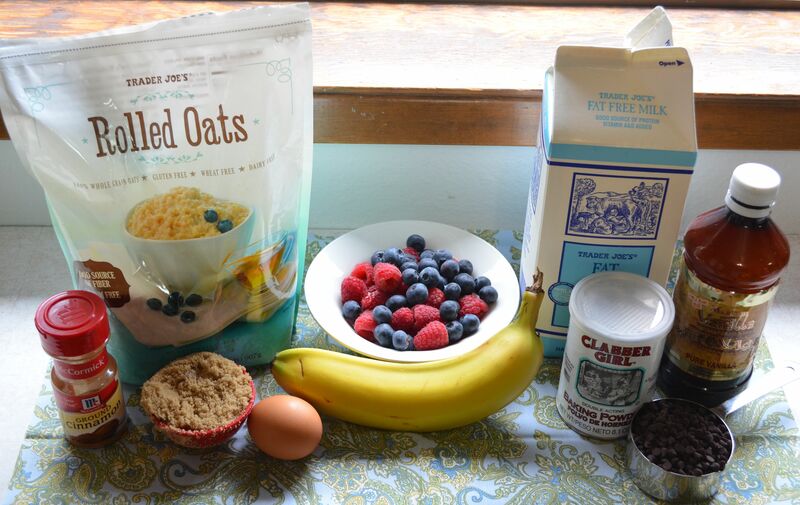 2 cups gluten-free rolled oats * (I used Trader Joe’s, if you can’t find gluten-free, regular old-fashioned rolled oats are fine, if you do not need to eat gluten free). 1 cup raspberries (Any berries work). 2 cups milk (I used skim). 1. Preheat oven to 375°F and generously spray the inside of a 10-1/2 by 7 inch baking dish with cooking spray and place on a baking sheet. If you do not have that size-baking dish, a 9 by 13 pan is fine, will be a bit thinner, but just as yummy. – After melting the butter, let cool for a bit before adding to the milk and egg mixture. If not, your egg will cook, and it will be a lumpy mess. 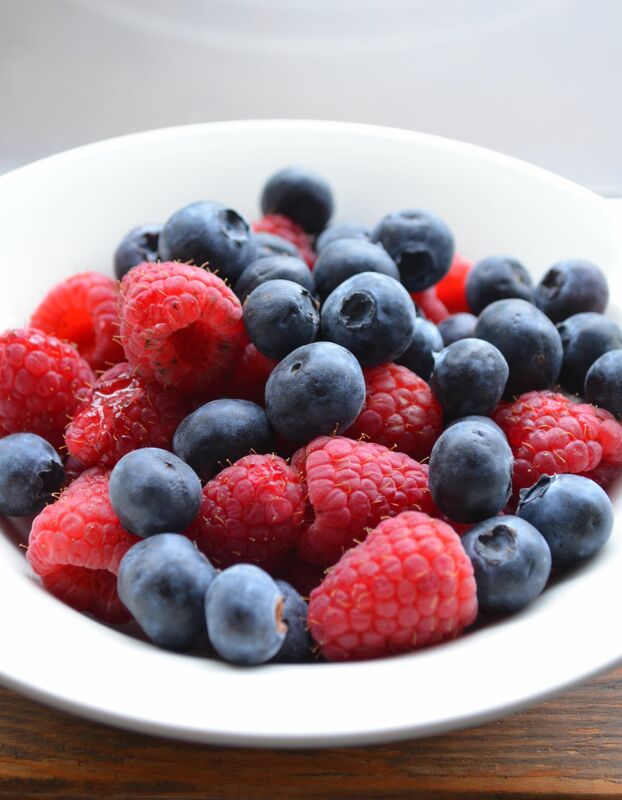 – If you have snack-y roommates, children, or significant others, let them know to not eat the berries in the fridge. I neglected to say that to Chris! Thank heavens he left me enough for the recipe. Feel free to use whatever berry you wish. You really just need a cup total for the recipe. – You can use regular chocolate chips; I just wanted to use mini size! Can it be frozen for future use?? Hey there! You know I haven’t tried that but I feel like it would be alright…if you try it let me know how it goes!